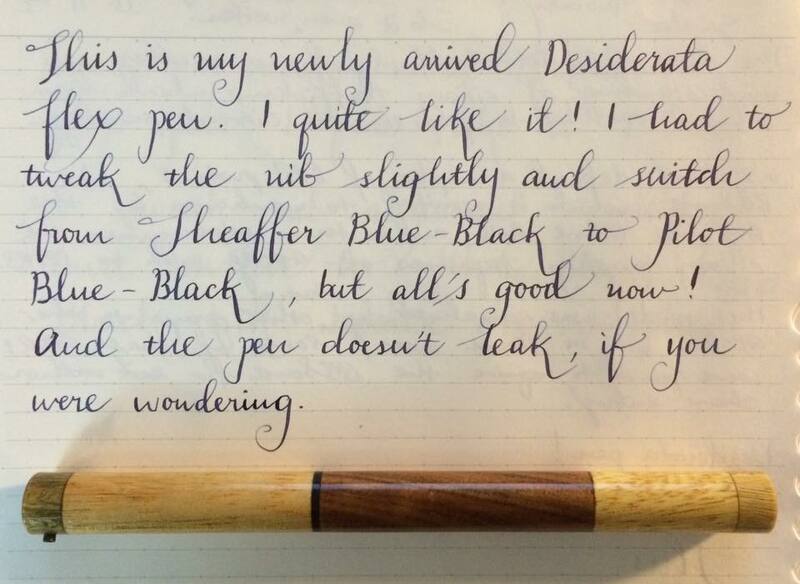 A review Is soon to come from me for this beautiful Desiderata Mercury Pen that just arrived. In my opinion first impressions are always most important. So here is my first impression on the pen. The pen arrived and it was boxed in the lovely post office small flat rate box. Nothing special, just something to get it to me safely in. Inside was some wadded up brown paper. One of those wads of paper was rolled up in a tube like shape. "That has to be the pen." I thought to myself. Next I noticed a very long user manual. I dislike user manuals. In general they seldom come in handy. This one however is super helpful and covers just about anything. The most notable thing in the manual for me was on the first page. Under Purpose the final bullet point states. I chuckled to myself when I read this and said. "Ha! We shall see about that!" After inking the pen which was very simple I blotted the nib, section and put the pen back together. I began writing. Oh dear was I surprised. It wrote perfectly. Free of any flaw. "This can not be." I muttered to myself. "No way!" I experienced absolutely no railroading. Nothing short of a beautiful and pleasant experience of flexy fun. In a couple weeks I will give a review of the pen, and take some photographs to go with it. Edited by FedericoMedina, 10 November 2014 - 22:10. I'll get mine in a couple of hours, barring any mishaps. Excited too! Just got mine, played with it a little. I'm pretty impressed. The G nib is nice. I'm using Pelikan black, probably not the best choice, and as long as I write fairly slowly it's fantastic. Being super happy with the pen so far I wanted to see if the feed could provide enough flow for a Hunt 101 nib. Being one of my favorite dip nibs I was hopeful. Wonderful job with these Pierre! Is the Hunt 101 softer or firmer or smoother or...? Cool, an experimenter. That's what I was hoping for. I think I'm going to have to jump on this with my next paycheck. . .